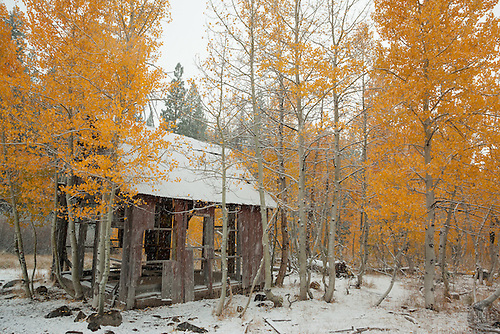 "Shack in the Aspens 4"
The fall colors in the Tahoe area can be amazing. Some years are better than others, this year has been a good one. Although some early snow and freezing night time temperatures caused some of the aspen to go brown before turning yellow, there has been plenty of aspen and cottonwood trees that did color up and offer some spectacular photo opportunities. The slideshow below contains photos that were shot this fall (2013). For the best viewing experience, click the full screen icon on the slideshow. Images are available as large fine art prints, stock photography, and as photo gift items. The fall season is still not over, I may add more photos to this slideshow soon... Thanks for looking!